Avoca is an unincorporated community in Jones County, Texas, United States. It is on State Highway 6 at the intersection of Farm to Market Roads 600 and 1636, 8 mi southeast of Stamford. 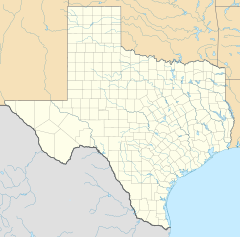 Avoca is part of the Abilene, Texas Metropolitan Statistical Area. Avoca was laid out at its current location in 1900 when the railroad was extended to that point; the town site had formerly been located a few miles away. The name is derived from the post office at the former site called Avo. The Lueders-Avoca Independent School District serves area students. Charles Stenholm lived in Avoca while a member of the United States House of Representatives. ^ Tarpley, Fred (5 July 2010). 1001 Texas Place Names. University of Texas Press. p. 16. ISBN 978-0-292-78693-6. ^ Barone, Michael; and Ujifusa, Grant. The Almanac of American Politics 1988', p. 1174. National Journal, 1987. This page was last edited on 15 April 2018, at 18:55 (UTC).